poivY is a free program that uses the latest technology to bring free and high-quality voice communications to people all over the world. When you use the free poivY software, you can call regular phones in various popular destinations for free* or call at an incredible low rate to any other phone on the planet. You can also call all your online friends (peer-to-peer calls) as long as you like, for free. 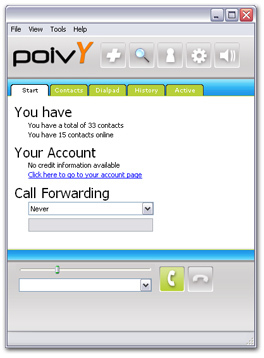 Just click here to download poivY; the download should take only a few moments depending on your connection speed.